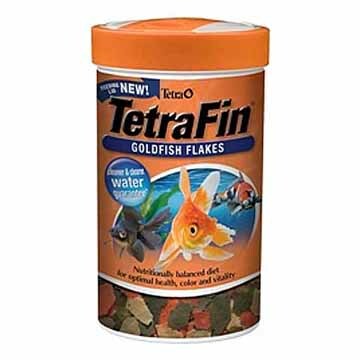 The latest version of Tetra’s flagship goldfish food has been optimized with the fishkeeper’s success in mind. Dispenser lids (on select sizes) allow hands-free feeding, and an easier-to-digest formula yields Tetra’s “Cleaner & Clearer Water” guarantee. TetraFin® Flakes continue to be packed with patented, health-enhancing ProCare. This precise blend of immunostimulants, vitamins, biotin, and Omega-3 fatty acids is custom designed to strengthen fish's resistance to disease and stress. This special ProCare formula meets all nutritional requirements of cold-water fish and will stay firm when fish strike. ProCare is a health-enhancing blend containing Omega-3 fatty acids to give fish the healthy fat needed for energy and growth; immune boosting ingredients; and other great ingredients.